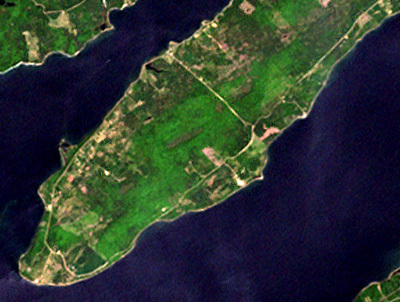 CanImage is an image composed of three spectral bands originating from resampled Landsat 7 orthoimages. The images are based on the on the National Topographic System (NTS) at the 1:50 000 scale. This product is distributed in GeoTIFF format. Since CanImage is a georeferenced image, it can be used as raster backdrop for various applications, such as ArcGIS, IDRISI, or MapInfo. Coverage Complete coverage of Canada. It is easiest way to determine CanImage image you require is to find it's NTS code (ex. 31H12). The indexes listed below can be used to find the NTS code. Example: to determine the NTS code for the island of Montreal, open Quebec NTS Index and zoom in on the map to the island of Montreal, the NTS codes are 31H05, 31H11 and 31H12. Citation (sample) Natural Resources Canada. Laurentides, Quebec. [computer file]. CanImage, 1:50 000, sheet 31H/13, edition 12. Ottawa: Natural Resources Canada, Geomatics Canada, 1995.